Musicians addressed the Board of the Pasadena Symphony Association Nov. 30, 2017. For those of you that don’t know me, my name is Marissa Benedict and I am the principal trumpet of your orchestra and have been for nearly 15 years. I am now the chair of the Orchestra Committee since the passing of Maurice Grants. We know that this is a first, having musicians speak at a board meeting during collective bargaining and we want to thank you for giving us the opportunity. We are at an extremely important moment for the future of our orchestra. The Pasadena board has always been an ally to musicians, so it’s natural that we should reach out to you to help us find a way forward. We want to make sure you have a full picture of the pressures that my colleagues and I face. We wouldn’t be here if we didn’t think it was important for you to hear from us, both in thanking you for all you’ve done in the recovery of the orchestra, and to share our frustrations and concerns regarding the integrity of the orchestra. I’m Trina Hodgson. For nearly thirty years, I’ve loved playing in this orchestra because of a few unique characteristics that separated it from similar orchestras in Los Angeles. First, the Symphony attracted the highest caliber musicians in town. As freelance musicians, we make a living by piecing together regular work and filling in with other casual work. Choices are made in priority of repeat work, compensation, and the quality of the job. Before the crisis, this orchestra was a higher priority job for the tenured musicians because it offered competitive compensation, and programmed concerts that used the whole orchestra, making the work regular and guaranteed. Because of this, the orchestra personnel was consistent and the sections were cohesive from many hours of working and playing together. This raised the level, efficiency, and quality of concert preparation because the music director could work on higher level musical ideas during rehearsals. The musicians loved playing in the orchestra because they were playing great music with great musicians. The audiences loved coming because they were getting world class performances in their home town. Additionally, the board and the orchestra had a working relationship of mutual respect and appreciation. The board took care of the business and the musicians took care of the quality of the product. The consistency of orchestra personnel made us familiar to our audience members and our donors. The Women’s Committee’s Saturday morning breakfasts gave us a chance to mingle with board and committee members, and set a festive mood for the evening’s performance, connecting us all together in sharing this great musical experience. In those days there was a symbiotic relationship between the orchestra and the Association – we were working together to create something special and everyone benefited from the experience. It was because of this spirit that we saved our orchestra in tough times. When the crisis hit, it hit musicians hard too. Even though other sources of our employment and income declined and many musicians were struggling to make ends meet, we didn’t hesitate to do whatever it took to keep this orchestra going. We were more than willing to play a free concert. We agreed to financial and logistical concessions because this was *OUR* orchestra and we were dedicated to keeping it alive. Our close relationship with management and with you the board members gave us confidence that our sacrifices would be recognized in the future. The orchestra showed extreme commitment to this organization, but not without receiving commitments from management in exchange. When we agreed to fewer rehearsals, a double concert day, and no raises for years, the executive director promised that these were temporary, stopgap measures that would be addressed when things improved. We were told that the repertoire would be carefully considered so as to accommodate the challenges caused by having fewer rehearsals and the physical requirements of a double performance day with only a short break. We were not told that repertoire would become more challenging without considering the toll on musicians bodies. We were not told that our string sections would be cut and that many of the musicians who volunteered to play for free would cease to be called for regular work in the future. We were not told that our new management would disavow those old commitments and speak dismissively about the sacrifices we continue to make to keep this organization afloat. Working at PSO is no longer enough to pay the bills for many of our colleagues. These are professional musicians with decades of training, school loans, and instrument loans to pay. The instruments we bring on stage cost tens or hundreds of thousands of dollars. Many of the members of our orchestra are renters with rapidly rising rents. We are parents trying to send our children to school while spending countless hours of uncompensated practice time preparing for rehearsals and concerts. We have to be able to make a living when we perform. Regular orchestra pay for a 5-service concert set is extremely low. For context, compare our wages over the last 10 years with the rising cost of living. This doesn’t even account for the extreme rise in housing costs in Los Angeles that have far-outpaced these numbers. We understand that fundraising is difficult, and that the board here has done tremendous work out of a love for music and musicians. We also see that PSA has been able to address rising costs in every other area, but has failed to make significant improvements for the performers. Over the past 7 years, the PSA’s overall budget has increased by more than 33%. As you can see from our chart, the cost of living has gone up more than 20% in the past 10 years, leaving musicians at least 14% behind. When venues become more expensive, the board has found a way forward. When vendors charge higher rates, you’ve found a way. We applaud the hard work it’s taken to meet these needs, but we wonder whether we’re being forgotten. As every other budget item increases, so too do our costs go up. Our rents increase. The cost of a home is skyrocketing. Sending our children to college is more and more daunting. Now less than ¼ of the Pasadena budget is spent on the orchestra. Our national player conference, the Regional Orchestra Players’ Association, upholds a standard that orchestras should dedicate between 42% and 45% of their budgets to their orchestra expenses, including cartage, benefits, payroll taxes etc. Our numbers are far out of line. 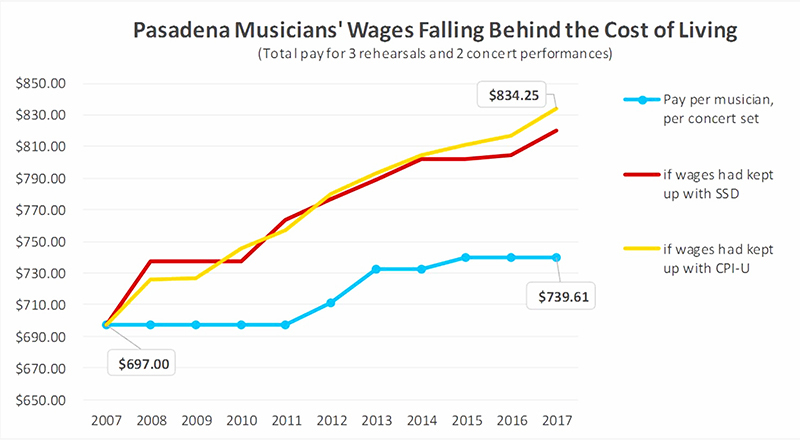 We should all find it troubling when only one quarter of every dollar given to The Pasadena Symphony and Pops goes to the musicians on the stage. The orchestra members we represent remember the promises made by management and they have high expectations. However, we’ve listened to our counterparts during negotiations and we have reduced our proposals significantly. They are not only well below the national average, in terms of budget allocation, but they would still leave us well behind the cost of living. Pasadena musicians care about this orchestra. We appreciate our board members and donors; we love playing wonderful music for our community, but because of the stagnant conditions, we’re already seeing the orchestra we fought to save come apart. Dedicated musicians turn down concert after concert. Longtime members of the orchestra resign in greater numbers each year. Musicians are struggling to pay their bills and morale is lower now than it was at the height of the crisis. We are here today to ask the board to prioritize the musicians that make up the Pasadena Symphony and to help us find a way to keep performing excellent music in Pasadena.